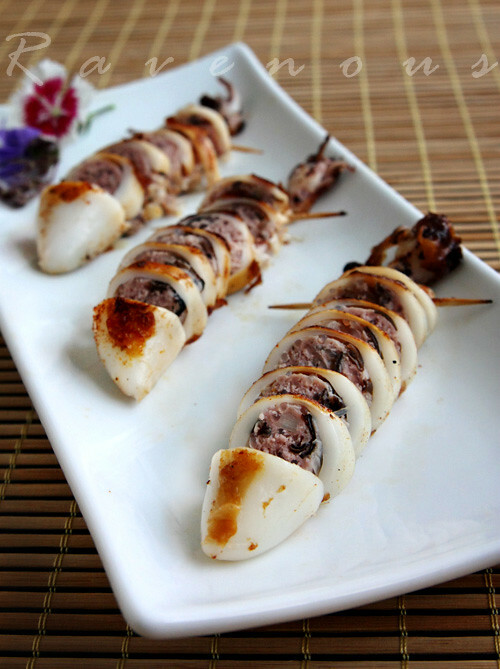 Muc nhoi thit (Vietnamese stuffed squid) was a request from one of our loyal readers, Tung from Orange County, and luckily we had extra stuffing from our stuffed tofu (dau hu nhoi thit) so we decided to honor his request. Again, we’re using the very versatile and tasty pork, bean thread noodles, wood ear mushroom stuffing that we used to stuff tomatoes and tofu in our previous recipes. If you’re busy like us, you can make your stuffing in bulk and portion them in small zip lock bags to freeze and use them in whatever you would like to stuff. 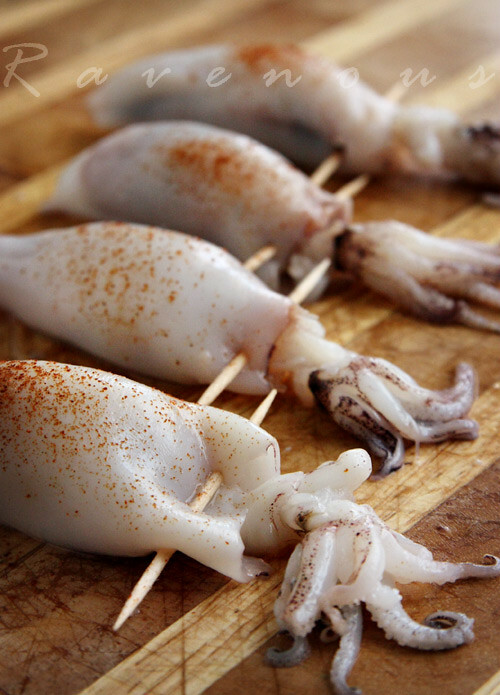 Pre Cleaned squids are found in the frozen section, but you can also clean your own squid. Todd and Diane of White on Rice Couple has a great video with upbeat Vietnamese music to match. Ours was pre-cleaned and we love the tentacles so we kept those on. Rinse squid and pat dry and set aside. In mixing bowl, mix together the pork, fish sauce, sugar, pepper, salt, shallots, wood ear mushrooms, bean thread noodles and mix well. Carefully stuff the pork mixture into the squids a little at a time, pushing it further to the end of the squid with your finger. Try not to overstuff the squid because you don’t want to break it and want the meat to fully cook without overcooking the squid. Pierce the ends together with a tooth pick (see photo below). Lightly drizzle with olive oil and sprinkle touch of sea salt and paprika. Heat sauce pan with about 1 tablespoon of vegetable oil. The pan should be on medium high heat to sear the outside -flip once, then cover and then reduced to medium low. The trick is to not over cook the squid or else it might get tough. Cooking time will vary depending on size of your squid and how much you stuff. Fry in batches and serve immediately. For a variation, you can add chopped tomatoes and vegetables to make a sauce for this dish. We tested out these new Calphalon Unison Nonstick Sear pans and used only the oil that we drizzled on the squid. It worked great and left nice sear marks. You can use any dipping sauce you like. We like a a combination of Sriracha and hoisin sauce or a great summery chimichurri sauce. Muc nhoi thit has a great charred flavor and we love the crispy tentacles along with the flavorful stuffing. A perfect snack with a bottle of beer. 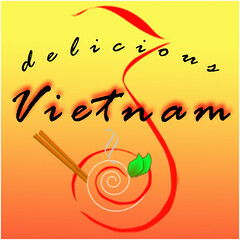 We’re submitting this recipe to Delicious Vietnam #3, a monthly event created by A Food Lovers Journey and ourselves. The July event is hosted by Budda Bellies. Please submit your posts to Anne at buddhabelliespdx [at] gmail [dot] com by 7 pm pacific time July 11. The stuffing sounds wonderful and they came out super…would love a serving now. 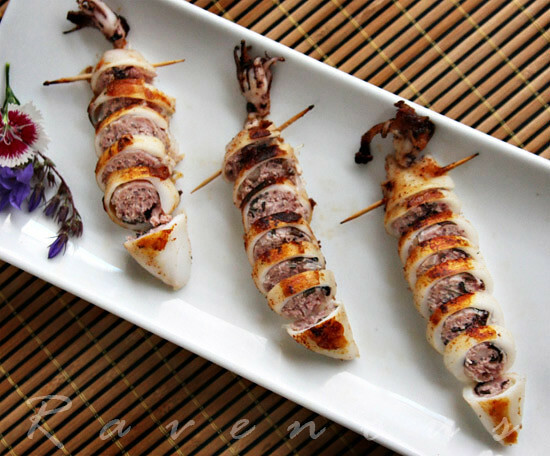 Peter M: we'll love to be share the stuffed squid, but it's so easy to do too. Squids aren't the most pleasant-looking creatures but here, I think you've just proved me wrong! How pristine and elegant do they appear, all bright and white with a golden trail. Btw, great blog. I love that you make Vietnamese cuisine so accessible for readers. I like how versatile the stuffing is, and great idea to make in bulk for other recipes. 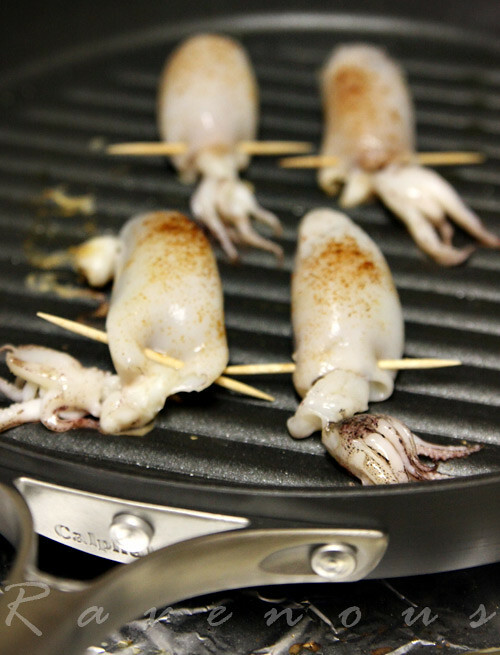 I also like that the squid can be grilled in a pan, great for people without access to outdoor grills. Have a great 4th of July in Connecticut! Such cute little squidlets! Never tried keep a squid whole, complete with tentacles but I'm definitely going to keep this in mind for the next bbq. I'm a sucker for anything with bean thread noodles in the stuffing and these are no exception. Looks great! I saw this in a cookbook years ago and have always wanted to make it yet for some reason, never have. Yours looks even better than I remember. Gotta get on it! thanks everyone for your comments..we're going on vacation ..hope everyone has a great 4th of july! 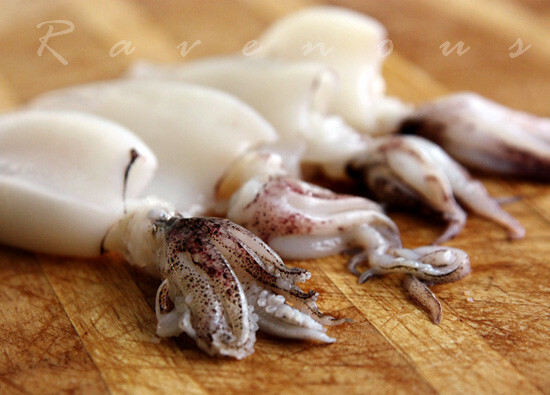 I followed this recipe and the squids tasted great. However, when I seared it, a lot of juice from the squids came out, although I already patted dry them before cooking. How do I avoid this? Tran: could it be possible that when the squid was washed, some water was still in inside the body? we didn't find excess liquid to be a problem. Here in our place, squid is very rare. That is why most of us are very excited to eat squids. Your squids are very different. What do you call that recipe? I'm so delighted to have found your blog!! Raised on Danish/European fare my whole life, I've only recently been brave enough to attempt Vietnamese and other Asian dishes. I'm so glad to find someone who will teach me how to do them beautifully and properly. oh WOW this is what I'm talkin about! This would be perfect for the summer and what a creative item to place on the grill — I will definitely have to try this once we move in Beautiful dish! These look so cool! Awesome presentation – they look like dragons. Thanks for this recipe, I made a variation of it actually. 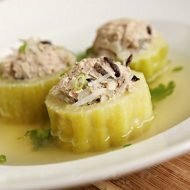 I didn't have the mushrooms or the glass noodles, so I cheated and used celery instead. It still came out well I think. 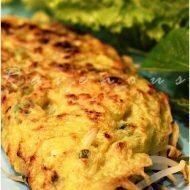 I am just getting into Vietnamese foods and I really love your blog. I am sure I can learn a lot, thank you. 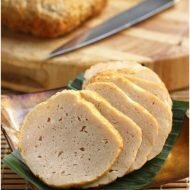 Whats a good substitute for pork? Also, I live in OC, what market has the pre cleaned squid? Can't wait to try this! Oh this recipe was so delicious! It’s probably one of my favorite foods now. It’s perfect for summer bbq’s as it grills up fast and can be prepared beforehand. I’m sure it would be great all year-round though. Fantastic! We tried this and loved it, and great idea on the simple sauce. I tried this recipe the other day but added coriander and mint in it as well to the pork filling. OMG it is sooo yummy! Would’ve taken a photo and sent to you but my friend didn’t arrange it very nicely! Holy crap, those look delicious! Made the stuffed squid tonight. It was Awesome! Served it withstir fried asasparagus. Clean plates here! This was my first time making stuffed squid. I tried your recipe and the stuffing took much longer than expected. With hungry family hovering over my shoulder, I decided to steam the squid prior to frying to speed up the process. Unfortunately, this made the squid a little dry. Any suggestions? Good stuff! I served it with a tomato based sauce.